When Mirvish opened its sit-down production of the musical Once on February 22, the question on everyone’s mind was, “Would the new production of Once with its all-Canadian cast be as good as the superb touring production that Toronto saw in 2013?’ The answer is “No – the new production is better!” Excellent though Stuart Ward and Dani De Waal were as Guy and Girl, Canadians Ian Lake and Trish Lindström, best known for their recent work at the Stratford Festival, give much more detailed performances and bring much more emotion to the songs. Once is already a wonderful lo-fi, acoustic musical that focusses on the intricacies of character rather than the bombast of spectacle. Now, with Lake and Lindström the musical is even more moving and true-to-life. The musical, based on the 2006 Irish film of the same name, tells a kind of urban fairy tale about a Dublin busker Guy (Ian Lake), who in the depths of depression after breaking up with his girlfriend happens to meet a guardian angel in the form of Girl (Trish Lindström), who not only pulls Guy out of his depression but encourages him to record a demo of his songs and move to New York in hopes that a major record label will sign him. Over the course of their music-making the two fall in love. As it happens, however, Girl has a daughter living with her and, unfortunately, still has a husband who has left her to live in the Czech Republic. the selfishness of personal love so that the other can try to reclaim the wholeness they once felt with their previous partners. In his six year at Stratford, the Festival had never made use of Ian Lake’s musical talent. His singing voice is dark-hued with a bit of grit in it but he also has a lovely falsetto. This suits blues and folk music well and is also perfect for the character of Guy. His first song “Leave” unleashes such a torrent of heartache and pain that it fills the entire auditorium. It’s no wonder it should attract Girl’s attention. At the beginning Lake’s Guy radiates such an aura of despair, we don’t see how he will ever overcome it. Yet, his cry of pain is also a cry to be helped, and Lake carefully delineates Guy’s slow recovery from self-loathing to confidence. Lake is so deeply engaged with his character that we watch every move and listen to every inflection in his songs for signs that Guy has overcome the darkness. This is the ideal role for Lake and he gives an outstanding performance. Lake is, of course, immensely aided by the equally powerful performance of Trish Lindström as Girl. The have a great rapport right from the start. It’s as if we know Girl is just the right person for Guy long before he does. Lindström has played any number of quirky characters in her career, so Girl is right in her line. The amazing thing Lindström is able to do is convey Girl’s underlying melancholy beneath her superficial chirpiness. She makes sense of the character by showing us that by helping Guy she is also helping herself by feeling that she is of use to somebody in need. Lindström brings real pathos to Girl’s only solo song “The Hill” where she reveals her own heartache. The combination of Lake and Lindström make their many duets especially passionate. Music is the only way Guy and Girl ever join together and Lake and Lindström convey this awareness in every line they sing together. 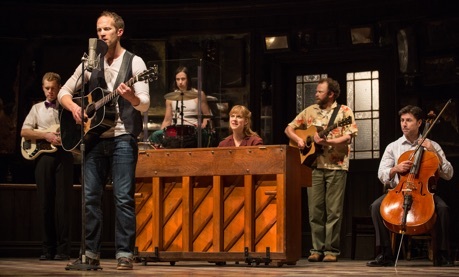 This makes the reprise musical’s best known song “Falling Slowly” almost unbearably intense. Lake and Lindström are supported by a multi-talented cast that proves that Canadians are as good as if not sometimes better than their international colleagues. Tiffany’s concept is that all the action is recreated inside a set representing a typical Irish pub. Here, as in John Doyle’s revolutionary Sweeney Todd that played Toronto in 2007, the actors also double as the orchestra. Tiffany’s production, where the cast looks on from the sidelines when they are not playing their parts, suggests that the entire community is involved in the story of Guy and Girl. Those who saw Once in 2013 will recognize Donna Garner as Girl’s mother Baruška in the tour. Besides being a fine accordionist and dancer, Garner captures Baruška’s oddball wit that helps explain Girl’s unusual nature. Nathan Carroll is funny as Girl’s overly optimistic brother Andrej. Brandon McGibbon is a hoot as Girl’s other brother Švec, who enjoys showing off the English he has learned from watching an Irish soap opera. McGibbon may be best known as an actor but he also is adept at playing guitar, mandolin, banjo and drums. Emily Lukasik excels not only in acting the part of Girl’s friend Réza but in singing, dancing and in playing the violin. The book by Irish playwright Enda Walsh balances the emotion of Guy and Girl’s story with humour. Part comes from Girl’s two brothers, the rest from Billy, who owns the bar where Girl practices the piano and Billy’s nemesis the Bank Manager, who gives Guy and Girl a loan to make their demo. Stephen Guy-McGrath comes close to trying too hard to be funny as Billy, a half Irish, half-Spanish would-be macho, whose back acts up when he tries to impress people with his dance moves or martial arts. Jon-Alex MacFarlane is far more subdued as the Bank Manager, which only makes his painful howling out of his own song “Abandoned in Bandon” all the more hilarious. The cast is rounded out by Brendan Wall who plays the studio owner Eamon and Jeremy Walmsley who plays the Emcee at an amateur night. Both are most prominent during the half-hour-long pre-show of Irish and Czech folk music that precedes every performance. Laurie Murdoch gives a wonderfully warm performance as Guy’s Da, a father still recovering from the loss of his wife and worried by his son’s descent into depression. Unlike so many other recent musicals that seek to blast the audience into submission, Once wins us over with its gentleness and sensitivity. Tiffany’s minimalist staging only increases our focus on the characters and these are characters whom we care deeply about. In the midst of a cold winter, Once provides a refuge of warmth, joy and understanding even if those feelings are inevitably tinged with sadness. If you saw Once here in 2013, you must see it again with a Canadian cast who portray the characters and story with even greater depth. If you have never seen Once, make sure to see this production now. Photos: Laurie Murdoch, Donna Garner, Emily Lukasik, Jeremy Walmsley, Stephen Guy-McGrath and Nathan Carroll; Trish Lindström as Girl and Ian Lake as Guy; Nathan Carroll, Ian Lake, Brandon McGibbon, Trish Lindström, Stephen Guy-McGrath and Jon-Alex MacFarlane. ©2015 Cylla von Tiedeman.